Insular Life CEO Nina D. Aguas (2nd from left) and President and COO Mona Lisa B. de la Cruz (3rd from left) received the two awards from Asian Banking & Finance Magazine Editor-in-Chief Tim Charlton. With them is Insular Life Sr. Asst. Vice President and Public Relations Head Ana Maria R. Soriano. Insular Life won as the Domestic Life Insurer of the Year – Philippines, and the Digital Insurance Initiative of the Year – Philippines Awards in the Insurance Asia Awards 2017 held at the Shangri-La Hotel in Singapore on July 13, 2017. 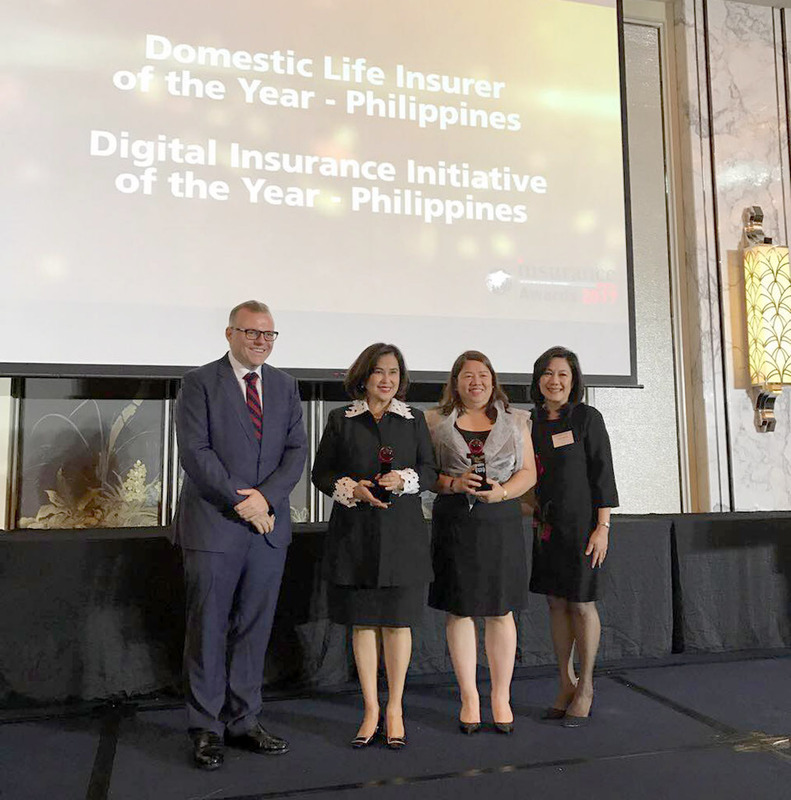 The first and largest Filipino life insurance, Insular Life, won the Domestic Life Insurer Award for being the only domestic life insurance company among the top industry players dominated by foreign-owned companies. Insular Life, now on its 106th year in the industry, continues to grow as it posted a net income of P3.7B, net worth of P43.9B, and assets of P133B in 2016, earning for the company 164%, 73%, and 164% increase from the previous year, respectively. It also received the Digital Insurance Initiative of the Year Award for its Automated Underwriting System (AUS), which is a first in the local industry. The AUS is the Company’s rules- based underwriting system integrated with the Company’s online proposal, application tools, and administration system, which enables Insular Life to render quickly an underwriting decision during the policy application process. The AUS has also empowered the Company’s agency force to become more professional in their prospecting, selling, and servicing activities, as well as effectively provided immediate insurance coverage to customers. Winners in the Insurance Asia Awards 2017 were chosen by an esteemed panel of judges from Deloitte, Millman, Inc., Ernst & Young, and KPMG Singapore. Insular Life also recently won the Reader’s Digest Trusted Brand Gold Award in the life insurance category, scoring significantly high in the criteria of Trustworthiness and Credibility, Quality, Value, Understanding of Customers’ Needs, Innovation and Social Responsibility. In 2016, it was recognized as one of the Most Innovative Companies of the Year by Asia CEO Awards, and has topped the ASEAN Corporate Governance Scorecard for the life insurance sector in 2015 and 2016. The Insurance Asia Awards aims to honor companies that rise above the challenges and recognize their initiatives that make the most of the lucrative opportunities in the market. It is given by the Asian Banking and Finance Magazine, the leading publication for banking and finance executives in Asia.